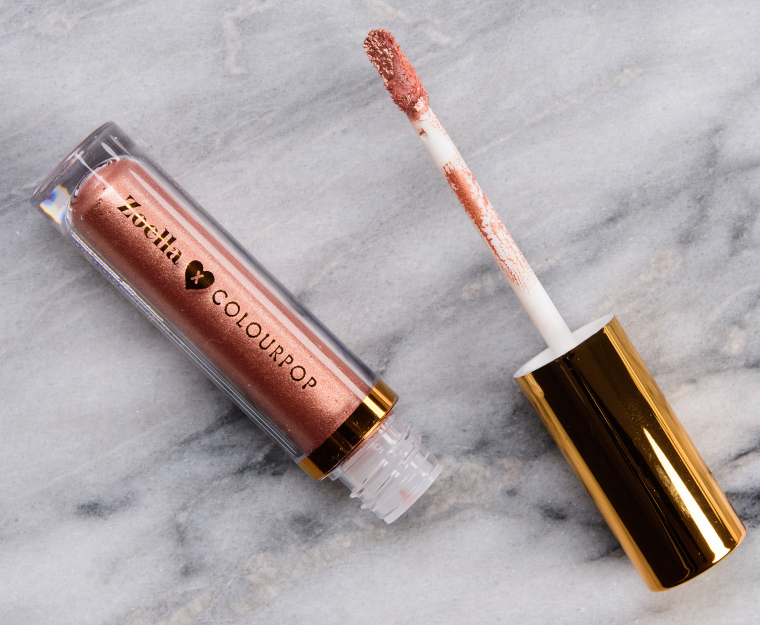 Colour Pop Bellini Supernova Shadow ($7.00 for 0.17 oz.) 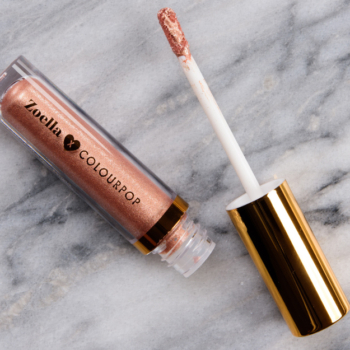 is a light-medium, rosy copper with subtle, warm undertones and a bright, metallic finish. It had rich color coverage that adhered evenly to bare skin applied with the included doe-foot applicator or with a separate brush (the latter was my preferred method to minimize cross-contamination). The texture was smooth, more mousse-like, which seemed to help the product go on more evenly and prevent it from sheering out too readily. It dried down and set to a transfer-proof result for a good 10 hours on me. Tom Ford Beauty Paradiso (Cream) (LE, $45.00) is less shimmery (95% similar). Giorgio Armani Stellar (5) (P, $36.00) is less shimmery, lighter (90% similar). NARS Earthshine (P, $22.00) is lighter (90% similar). Cover FX Soleil (P, $28.00) is darker, warmer (90% similar). Anastasia Rose Quartz (LE, $12.00) is less shimmery, lighter (90% similar). Dior Aurora (825) (LE, $32.00) is cooler (90% similar). Smashbox Rose Rocked (LE, ) is lighter, warmer (90% similar). LORAC Iced Rose (PiP, $19.00) is lighter, more muted, warmer (85% similar). Lancome Brune Glace (LE, $26.00) is less shimmery, darker (85% similar). Too Faced Strawberries and Champagne (P, $22.00) is less shimmery, darker (85% similar). 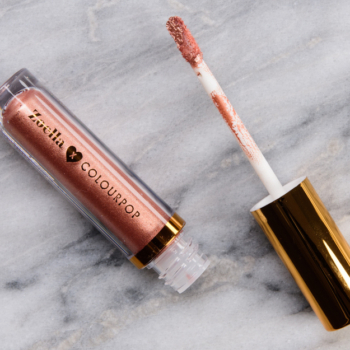 Per the brand, the formula is supposed to be a "super longwearing liquid shadow" that can be used as "an all over base color, a touch of glitter, or extreme metallic foil" with "high coverage" and "no fall out." They were quite pigmented, and they sheered out a bit as liquid and cream products do as you diffuse the edges. The liquid eyeshadows applied better with an exterior applicator, whether synthetic brushes or fingertips (though I'd recommend swiping product onto a clean palette or brush rather than directly onto fingertips!). The wand applicator makes it hard to apply with precision and worked best for all-over, one-and-done application. The formula felt watery and thin, and it spread out decently, but there was a lot of fine and larger shimmer/sparkle without a strong base color, so they tended to look better and more even in person as the shimmers reflected light. They dry down fast enough that I could diffuse and blend edges but not so slow that it pulled into my creases as it dried down. I found that they tended to breakdown from teary or watery eyes, as I always noticed gaps or missing pieces where I might water more (inner and outer corners) but did not have that issue elsewhere (like the lid). I think the more glittery shades worked best as something layered on top of other products and not as much on their own unless used as liner--they seem to do okay as a thin line, likely due to the fact that it's just a lot harder to see any imperfections when the line itself is thin. More metallic, less sparkly/glittery, shades seemed to work best alone (as they were quite pigmented, too, so they didn't lend themselves well to layering). I didn't have much fallout over time but occasionally, there was a small chunk of product that dropped (rather than a few stray glitters). I also felt like the smoothest application was with fingertips as a brush seemed to make the product more likely to clump up or accentuate lid texture. Browse all of our Colour Pop Supernova Shadow swatches. Water, Synthetic Fluorphlogopite, Vp/Va Copolymer, Glycerin, Butylene Glycol, Benzyl Alcohol, Sodium Carbomer, Chlorphenesin, Tin Oxide, Dehydroacetic Acid, Iron Oxides (CI 77491), Mica (CI 77019), Titanium Dioxide (CI 77891). Colour Pop OG Supernova Shadow ($7.00 for 0.17 oz.) 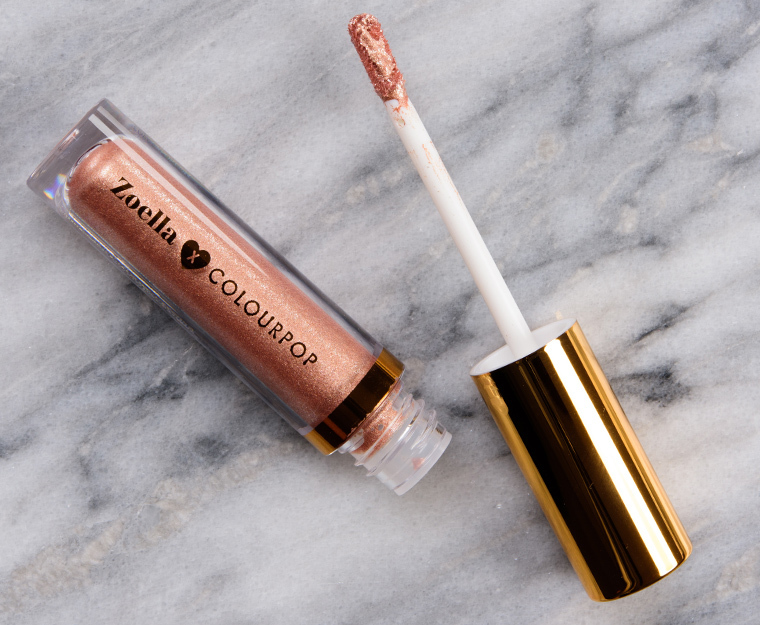 is a light, golden copper with strong, warm undertones and a sparkling, metallic finish. It had a chunkier texture as it dried down, which gave it a more uneven look on my skin, though it was incredibly reflective which masked a lot of its unevenness. The consistency was thin but airy–almost a little mousse-like–and applied with semi-opaque, buildable pigmentation. It stayed on well for eight hours before there was slight flaking. LORAC Rose Gold (LE, $19.00) is less shimmery, darker (95% similar). Dominique Cosmetics Crème Brulee (PiP, ) is darker (95% similar). MAC Beam Time (P, $22.00) is darker, warmer (90% similar). Rouge Bunny Rouge Angelic Cockatiels (P, $19.00) is less shimmery, darker (90% similar). NABLA Cosmetics Fabric (PiP, ) is less shimmery, warmer (90% similar). 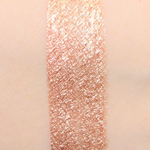 NARS Old Church Street (Left) (LE, ) is less shimmery, darker, warmer (90% similar). 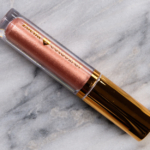 Laura Mercier Intense Rosegold (LE, $28.00) is less shimmery (90% similar). Too Faced Push-up (2018) (PiP, $16.00) is less shimmery, darker (90% similar). NARS Endless (DC, $25.00) is less shimmery, warmer (85% similar). Urban Decay Steady (LE, $19.00) is less shimmery, warmer (85% similar). Water, Calcium Sodium Borosilicate, Polyethylene Terephthalate, Polyurethane 33, Vp/Va Copolymer, Glycerin, Butylene Glycol, Benzyl Alcohol, Sodium Carbomer, Chlorphenesin, Tin Oxide, Dehydroacetic Acid, Aluminum Powder (CI 77000), Iron Oxides (CI 77491), Mica (CI 77019), Titanium Dioxide (CI 77891). Colour Pop Supernova Shadow $7.00/0.17 OZ. I love both these shades and Bellini is sensational. At first I thought it was a lip gloss, but even better it is an eye cream. Stunning – and so inexpensive too.